Series BCZUD Universal Heat Set Nozzle Cylinder – Available Now! PHD is pleased to release the Series BCZUD Universal Nozzle Cylinder for the plastic bottle blowing industry. The new Series BCZUD (heat set) Cylinder complements the BCZUS (cold set) Cylinder, and expands our proven series of Sidel® solutions. Series BCZUD Universal Nozzle Cylinders are direct replacements for Sidel Universal Heat Set Machines. These cylinders mount in the same space with matching bolt patterns, provide significantly longer service life, and reduce maintenance and downtime in stretch blow molding applications. Units are field repairable and feature improved geometry over OEM units to reduce component fatigue. Need more info/pricing? Contact FPE Automation. Electrostatic charges disturb smooth operation.Fortunately, Panasonic offers a variety of ionizers to eliminate static. Smart Vision Lights continues to enhance their product line with the innovative MultiDrive™ and OverDrive™ Strobe features, applying them to the LM45 and LM75 Series, the latest in broad-spectrum mini linear lights. Unprecedented levels of light (with a singularly small footprint), multiple lensing options, overcurrent protection, and quick-disconnect cables are just a few of the many features. 3D laser displacement sensors provide three-dimensional inspection of any part. Cognex 3D profilers provide a topographical representation of the 3D features of a part relative to any surface including volume, area, height, tilt, circle fitting and curvature. These industrial sensors come bundled with a vision controller, Cognex Designer software and world-class 3D and 2D vision tools. Announcing special pricing for 2017! 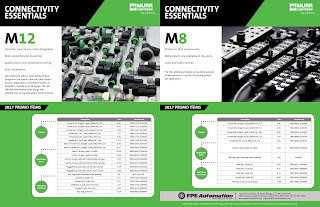 Once again, FPE Automation has teamed up with Murrelektronik to bring you a wide variety of essential M8 and M12 connectors. Download/view the 2017 FPE Automation/Murr Connectivity Essentials flyer. FPE Automation and Cognex hosted event. Introducing the NEW Cognex In-sight 2000 color vision sensor. FPE Automation and Cognex bring the very latest to you during this valuable, hands-on seminar. You’ll leave with relevant knowledge you can leverage when you’re back on the job, for measurable results. 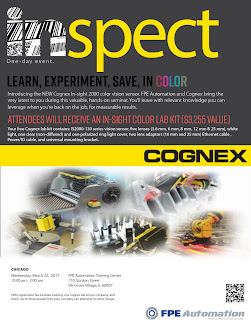 $990 registration fee includes the full day of training & lunch for up to three people from your company, and one Cognex in-sight color lab kit per company. Kit contains: IS2000-130 series vision sensor, five lenses (3.6 mm, 6 mm, 8 mm, 12 mm & 25 mm), white light, one clear (non-diffused) and one polarized ring light cover, two lens adaptors (16 mm and 25 mm) Ethernet cable, Power/IO cable, and universal mounting bracket. NEW DATE ADDED BY POPULAR DEMAND! View this event on FPE Automation's Facebook page. 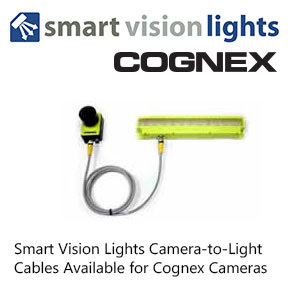 Smart Vision Lights is now offering its camera-to-light series of cables for cameras made by Cognex. The CTL Grey Series cable provides a direct wire connection between a single light and Cognex's In-Sight® series cameras. Also available is the OverDrive Dataman® Light Module, specifically engineered to mount and integrate seamlessly to the front of Cognex's Dataman® camera readers.